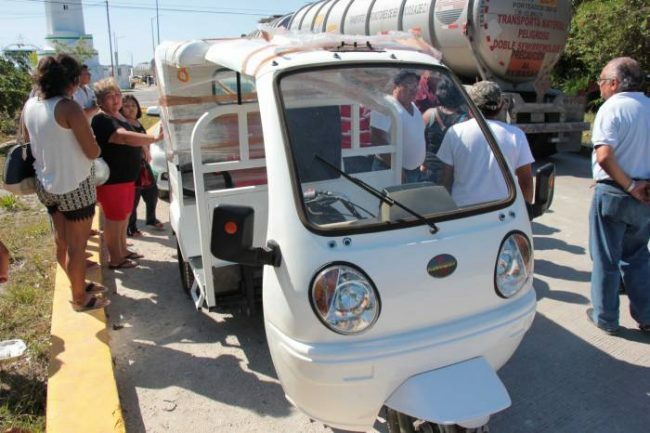 The first two operators of prototypes of motorbike taxis in Cozumel, owned by the Transport Cooperative Nohoch Be, were arrested by personnel of the Infrastructure and Transport Ministry (Sintra) of Quintana Roo state during an operation. The representatives of that agency refused to make clarifications on the reasons for detention, while the members of the cooperative said they had not violated any law by circulating these vehicles in the city, and didn’t rule out their intentions to apply for a transport permit for the municipality and the whole island. For the first time in the history of public transport in Cozumel, it was known of the intention to put in operation a service for the population in order to break the monopoly that the Adolfo Lopez Mateos Taxi Drivers Union has mantained on this service. The moto-taxis, with capacity for four people plus the driver, handn’t traveled 500 meters on Cozumel lands when representatives of the Sintra detected immediately and stopped them at the intersection of Miguel Aleman Avenue and Rafael E. Melgar street. Santiago Audomaro Herrera Silva, president of the Cooperative Nohoch Be, which numbers 270 members after one year of existence, said these vehicles are of particular and exclusive service for the cooperative and that at the moment they do not attempt to give this service to the public. However Sintra workers requested the Municipal Police to confiscate the vehicles, but the elements of the corporation found no legal reason for their detention so a discussion between the three parties began. The moto-taxis were purchased in Merida at a cost of 70 thousand pesos each. Herrera Silva said that they intend to obtain a concession, and he claimed the population is not served by taxi drivers but they themselves can provide this service. He said he did not seek to break the law, adding they’re aware that the union of taxi drivers in Cozumel will endeavor to avoid them coming into operation.